President Donald Trump responds to late John McCain’s daughter Meghan McCain after she took a dig at him during eulogy speech. John Sidney McCain III, an American politician and military officer passed away on August 25th in Phoenix, Arizona, United States. Thousands gathered at the capitol to bid one last farewell at the funeral of senator John McCain. The 81-year-old died due to brain cancer. Major political leaders of America gathered at the funeral including former president Mr Obama and Mr Bush too to pay their tribute, except America’s present President Donald Trump. John McCain had told his advisers months ago that he wanted Bush and Obama to speak at his funeral, but never mentioned Trump’s name. How shameful to him! Though John McCain couldn’t make it to the White House while campaigning against Mr Obama and Mr Bush, he did certainly made good friends with them. 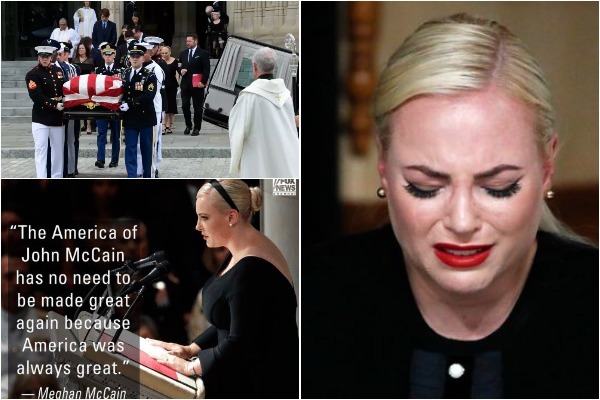 However, it was McCain’s daughter Meghan McCain whose eulogy for her father brought tears among the mourners and drew the loudest applause during the service. Without mentioning Trump’s name, she poignantly said her father was “American greatness”. Donald Trump had taken a stepping dig at John McCain in 2015 during his prisoner-of-war in Vietnam and said “I like people who weren’t captured”. You know, you might be President of the snowflakes but you are surely not acting like the President of the United States. A real POTUS would have ignored criticism, done the right thing and pay proper respects to a Senator who was a POW, maybe even apologizing to the family. Didn't you hear Megan McCain yesterday? Oh right, you weren't invited to her father's funeral. I will repeat for you…"America has ALWAYS been great" and it will be even great after Mueller time! Until you came in to office, America was respected, it was great, it was the leader of the world…. You have disgraced our country & should resign. Meghan McCain haven’t replied yet to Donald Trump’s CAPS ON tweet. John McCain will be buried at the Navy Academy at Annapolis in Maryland. Previous : BollyRecap In 2 Mins: Sushant Singh Rajput-Kriti Sanon Break Up To Priyanka Chopra-Nick Jonas’ American Wedding! Next : Is It A Box Office War Between Hrithik Roshan’s ‘Super 30’ and Kangana Ranaut’s ‘Manikarnika’?